Mental toughness is a concept that gets brought up a lot in the world of sport and sport psychology. But, it is time to put an end to it. The word toughness is synonymous to words like rigid, stiff, and inflexible. However, much like the athlete that is forcibly holding back tears, what happens when you apply enough pressure to something that is rigid, stiff, or inflexible? It breaks. 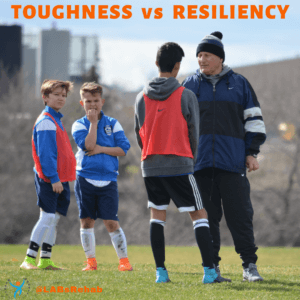 Coaches, parents, and athletes alike will use mental toughness to facilitate a champion culture; it is the idea that being mentally tough or “unbreakable” is what it takes to be the best. However, this misconception perpetuates the stigma around mental illness and, frankly, the experience of any negative emotions on and off the ice. It is doing more harm than good. Although in an effort to create winners, we are teaching our athletes that it is not okay to cry, to feel frustration, to ask for help. I have seen athletes consumed by guilt over showing up as anything less than focused, emotionally detatched and confident, but it is not their burden to carry. Sport is full of highs and lows. Athletes, no matter how experienced or elite, are human too. As such, it is only natural that emotions spike and confidence weans from time-to-time. It would be doing athletes a disservice to teach them anything other than that. Success in sport, and in life, is awarded to those who are resilient (not mentally “tough”). Resilience is a term used to describe one’s ability to bounce back from difficulties. In sport, it is what the best of the best are skilled at. Champions are flexible – they adapt to the changing needs of their sport in the moment. They recognize that failure is part of the process and that negative emotions do not equate weakness. It is the experience of being resilient that has brought them success, rather than their attempts to be mentally tough/rigid/inflexible. So, it is time we redifine what it means to be “tough” and what it takes to be a champion in sport. If we normalize the experience of things like fear, anger, and upset in sport, we will simultaneously reduce our athletes’ risk to poor performance and psychological burnout. Redefining strength, encouraging communication, and using preventative measures are a good place to start. Do not teach athletes to fear failure. Athletes who embrace failure become more resilient and perform better in moments of personal challenge. Post failure, coaches typically default to coaching the physical aspects of the game – how to adjust a shot, defend a play, etc. Along with this coaching of tactics, we should begin to integrate the training of mental skills, like resiliency, that acknowledge the role of emotions in the outcome of performance. Transforming an athletes’ relationship to failure allows them to take risks and exceed their boundaries; it is in these moments that they strengthen their ability to be resilient. Coach athletes to acknowledge negative emotions and manage them in ways that facilitate performance, instead of coaching them to be “tough.” Rather than waiting until they succumb to the pressure-filled highs and lows of the game, normalize the experience of upset and teach athletes how to bounce back. And please, if that seems like too large of an undertaking, just start with one action. Asking an athlete how they are feeling could make the world of a difference. Want to know more about this topic? Ask us how you can get the support you need to normalize the discussion, avoid burnout, and effectively contribute to the next generation of champions.